Our working group was formed in 2003 thanks to the experience in Palestinian refugee camps. In 2004 we organized Italy’s first peace camp, an experience of multicultural sharing with children from Shu’fat refugee camp and the Municipality of Rozzano (MI). In 2005 the first projects in Palestine and Mozambique took place. In 2006, we founded Vento di Terra Onlus on the basis of our common experience. The following two years were the basis of an original method we applied on larger projects. The starting area was Palestine with the management of educational services. In Italy, the support network expanded with the membership of ten local authorities of the provinces of Milan and Cremona, of which Rozzano was the leader. An awareness raising process started among the communities involve. 2009 was an important year: Peace Steps and the School of Tyres were born. Two complex and innovative projects in the OPT (Occupied Palestinian Territories). The former enabled us to develop a new model, a cooperative for the production of sandals in the refugee camp of Kalandia. It is a micro-enterprise associated with an educational service, whose products are sold in Italy through fair trade. The School of Tyres is the first Peace Architecture project. It is a bioclimatic structure, designed by the group ARCò – Architecture and Cooperation – built in the desert of Jericho with second-hand tyres. Due to the context, the project has had a wide media coverage. It houses a hundred Bedouin pupils, previously excluded from the right to education. In 2010 we extended our activities. After the earthquake in Haiti, we decided to act in support of the refugees with an agricultural and educational project. We activated a training intervention addressed to doctors from Makassed Hospital in Jerusalem, with the collaboration of San Paolo Hospital in Milan. We rehabilitated a second school in the desert of Jericho using straw, mud and bamboo. Nowadays the building houses 120 Bedouin children. And also in Mozambique, where we supported the farming community during past years, we built a new wing of the primary school in Milange (Zambezia). In December, the Ministry of Foreign Affairs recognized us as a non-governmental organization (NGO). 2011 was the year of the first project in the Gaza Strip for the Emergency Program of the Ministry of Foreign Affairs. It is a Children’s Centre for the Bedouin city of Umm Al Nasser: a kindergarten, a family desk and a health education device. The building, designed by ARCò – Architecture and Cooperation –puts in place the self-construction model on a larger scale. We also created a second social enterprise for the Bedouin communities in the West Bank, that enabled us to strengthen the collaboration with the fair trade network: the birth of the women’s cooperative Silver Tent, specialized in traditional Bedouin jewelery. 2013 was another important year for Vento di Terra: we started working also in Afghanistan and Jordan. In Afghanistan we worked in defence of women’s rights; the project “The Women of the Silk Road” in Herat province is being launched with the aim of improving the work and productivity of Afghan women in the silk market and launching new channels commercial for the producers of the Zinda Jan district. In Jordan, we began the first interventions in support of Syrian refugees allocated to informal camps in the Mafraq area. These were emergency interventions, with the distribution of essential necessities, along with educational and psychosocial support in the camps. In 2014, following the “Protective Margin” military operation, the Israeli army razed to the ground the “Children’s Land” childhood center at Um al Nasser, Gaza Strip, with no explanation. 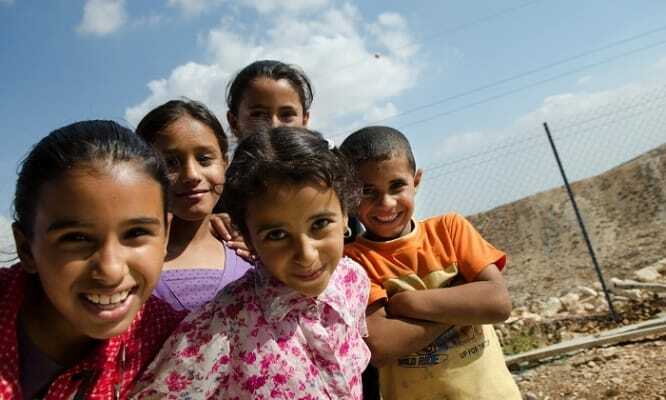 The Children’s Land Center was defined by everyone as an oasis of peace in the defence of children’s rights: with its destruction the village of Um al Nasser remains without a suitable place for the provision of educational services and socio-assistance to inhabitants. Given this, a campaign to raise funds for its reconstruction was immediately launched. Meanwhile, the school was temporarily housed in a municipal building and in September they resumed their classes regularly. In early 2015, the first block of the new Children’s Land in Gaza began: the Center for Women, in bioclimatic architecture, for the development of social and income-generating activities for women in the village. The Center for Women was inaugurated on November 25 of the same year, in the presence of the local staff of Vento di Terra, the Mayor of Um al Nasser and representatives of the European Union. Tailoring and carpentry workshops have been activated in the new center where women from the village are trained and can start a job. Particularly, a children’s playground program was launched, which is used in Gaza Strip facilities for educational activities, following the Montessori’s method. Meanwhile, in Jordan an Informal Education Center in the Mafraq Governorate was launched. The Center hosted 200 young people and promoted informal education, psychosocial support and guidance for vulnerable families living in refugee camps in the area. In February 2016, the reconstruction of the asylum of Um al Nasser began and was completed and inaugurated on December 13: just over two years after its destruction, the Children’s Land returned to be the heart of a Gaza resistance and hope for a future of peace. With the worsened situation of Syrian crisis, support efforts given to refugees intensified: a second Jordanian educational center in the Badia Nord district was set up to ensure inclusive educational paths for vulnerable refugees and Jordanians, even for people with disabilities, and psychosocial assistance to the families residing in the area of ​​Al-Sa’iediyyeh. In 2017, Vento di Terra decides to structure itself more in Jordan: a program is implemented that involves two primary schools in the municipality of Amman and three secondary schools in the north province of Mafraq. New actions are taken to support female employment in northern Jordan, with a project involving 80 women, mainly Syrians. 2017 is also the year for designing Vento di Terra in a new country: Albania. The architectural projects carried out in Palestine have stimulated a reflection on the possibility of applying the bioclimatic method in different contexts, so as to promote alternative development models. A project is therefore launched in Albania, in the Divjake nature reserve, south of Tirana. The intervention, carried out in partnership with “Politecnico di Milano”, responds to the need to strengthen the management skills of the local community according to the implementation of a development plan that safeguards employment and territory.